The Travelling Teddies: What A Bummer... I Failed My Driving Test! Got 38 points for the tests. Nope, in driving, the lesser points you get, the better your chances of passing... and you need at most 18 points to make a scrape-through. So how did i successfully earned 38 points? Here's how I did it in probably, 3 minutes. It all started fine that morning. I took half the day off, woke up early, did my prayers and had a nice hot breakfast, while watching TV. I looked calm, but the test and the anxiety and fear are all constantly at the back of my mind. I'm talking CONSTANTLY thinking of my driving test. It was so bad that my immunity levels dipped so low and i fell ill and developed severe gastritis - couldn't eat, couldn't sleep, was vomitting. I thought i had contracted some form of virus prior to the test. And so we met at the Centre, my driving instructor and i, at 10am that morning. My test was set at 11am. Got into the car, drove around the vicinity to get a feel of road hazards and conditions just so i can be "mentally prepared". He said, "Tak payah drive banyak banyak, makin banyak makin tak bagus..." (Loosely translated: "Don't need for too much practice on the road this morning. The more you drive, the worse it will be..."). And as we were driving to test out the roads, he was telling me about a freak accident that happened just outside the driving centre that morning. Thank you for that "not helping at all" information, i said to myself. We finally went into the Centre at 10 mins before the briefing, at 10.50am. (MY ADVICE is to: NEVER EVER do that... Always arrive at least 15 - 20 minutes before). That was when i told my instructor i wanted to pee sooo badly. I don't know what it was... whether i really needed to pee or it was just anxiety getting a hold of me. Anyway, he was briefing me about what to do, where to go and the documents i needed to give to the traffic police in charge. I wasn't concentrating AT ALL because my bladder was full! I was literally jumping in my little bear suit, clasping my two legs together so i don't pee in my pants. When he finally finished briefing, i walked as fast i could to the holding room. And like as though it wasn't torture enough, the holding room was all covered in black tinted glass ... all but a piece of paper on the window that says, "Driving Test Holding Room" - if you don't look at it properly, you won't know where the holding room was. And i didn't... because my bladder has taken the best of my ability to think straight! So i asked and asked around... After a good 5 minutes, i finally found the room (which was right before my eyes by the way) and hand over my documents for processing. I then excused myself, and went straight to the toilet. At the door of the toilet, a man asked, "Harlow... $0.20 to go toilet..." I looked at him with extremely pitiful eyes and said, "I don't have any money, its all in the car, i'm taking my test in 2 minutes and i really, really need to pee." As far as i can remember, i have never begged for someone to let me pee. So this was a first and it had to happen on my big day. One by one, our names were called out by this white and blue uniformed men who looked like they kill humans as a pastime. My name was called out at about 11:15am by this thin, short, Chinese but malay-speaking man (who still looked like he kills for fun..) He looked friendly, i thought to myself. Until the first thing he did was to ask me my IC number to verify. "Sxxxxxxxx...," I said. Maybe out of anxiety, i may have said it out too fast because he asked me again, "Tell me your IC number again..." .. So i said it again. And for the third time, he asked, "One more time? What's your IC number?..." I was already skipping many many heartbeats. If that initial questioning was a tactic to make me nervous - it sure was effective. I was a whole lot nervous now than i was ever before! And so we walked to the car at the parking lot. It was obvious that he was escorting me out and others who were outside looked on. They're probably saying, "Good luck to you... Not!". When we got into the car, listening to the advice that my instructor and friends gave, i pretended to shift the rear-view mirror a little, the side mirrors, my seat, put on my seatbelt... While i was doing all that "pre-flight" stuff, the tester stopped me and said, "Enough enough... Just move. Let's go." And so we drove off, into the circuit area. I saw my instructor who nodded at me from the Centre and i nodded back, almost saying, I'll do my best. I said to myself, I must pass. I have to. Everyone wants me to pass. Even the tester wants me to pass. So why shouldn't i? I'm ready to drive. After all, learning to drive is expensive. I have spent close to my monthly pay just to learn to drive. I spent 2 hours, every single day just to go through the same route over and over again. Failing a test means that i have to fork out, for at least another month of lessons; another month of sacrificing my time, my hard-earned money; another month of moving through narrow courses and crank courses (which i hate so much! ); another month of parallel parking, reverse parking, braking, getting the biting point right... I love to drive but learning it is just, a pain in the neck - both literally and financially speaking. So our first Course was the directional change (or 3-point turn) course, which i swear to God, i have done so many times during my practical lessons that it was difficult to flunk this one. I kept reciting to myself (weeks and days before the test) when i should turn and what i should do after turning. But when we went into the course, i lost all sense of reason and direction. My limbs were jiggly and my feet completely turned to jell-o. I put in my reverse gear, and turned the steering way too early that my right rear wheel almost striked a kerb. That's when he said, "You are going to strike a kerb you know. I'm warning you..." But i couldn't believe what i'm doing! I have completely lost my head! I forgot everything that was taught... EVERYTHING. I adjusted the car and made a reverse again. That was when i really hit the kerb. Thank goodness i was reversing slow enough so i didn't mount it, just touched it. Again i moved forward and reposition the car. And then i made another reverse attempt. AGAIN! MY REAR WHEEL HIT THE KERB! By then i was so freaked i couldn't think straight no more. I wanted to stop the car, apologise to the tester and run out crying to my instructor. It was that bad... Instead i took a long deep breath and exhaled out loud and said to my tester, "I'm really very nervous Sir. I'm sorry..."
And then he said, "Start your engine and try again. Start your engine... and reverse." Honestly, he sounded kind. He sounded like as though he was giving me a chance. Hmm.. maybe i'm gonna pass after all. Then i ignited my engine. It went screeching... I then revved it up again and ignited. The screech was so loud, it was deafening. This can't be... I know how to ignite a car, i thought to myself. He said, "Enough enough enough..."
You know what? My engine didn't die. That was when i realise... The MTF tricked me. What an a-hole! Arrrgh! But i had to maintain my dignity (or what's left of it) and pride and complete the test i committed myself to. So for the probably, 5th time trying, i finally get to reverse my car properly into the area and turned left to exit. That probably took me 3 minutes or so, but it was the longest 3 minutes in my life. I didn't see him writing anything - he was discreet. So there was still optimism. Maybe this guy's gonna give me a chance because i'm nervous. Haha! The rest of the Course was marked for minor mistakes. We went up and down the slope (which i got 2 points for "incorrect breaking technique" - hit the clutch first then the brake), into the crank course (which i did 2 reverse manoeuvre and also got 2 points for), reverse parking (perfect), S-Course (perfect) and parallel parking (which i got 4 points for failure to confirm to safety... blindspot, my instructor said). He then asked me to drive out on the road. I think i may have gotten one of the easiest test route that morning - been there upteenth time, i should know, i told myself. I still didn't know i was gonna fail when he cut short the test route and asked me to turn left (instead of going straight) to go back to the office. My general driving was quite good except at the traffic light, when my car stalled once, when i released the clutch too fast (because of some IDIOT who honked me the minute the light went green). So i was marked 2 points for "delay in moving off" - other than that, everything went perfectly smooth. During the debrief, the tester told me with this, i dunno, kind but almost "i'm-mocking-you" look painted across his face, "Your circuit is very bad. Very bad... So i cannot let you pass lah. Your driving is also, not so good. Your braking quite rough (even though that never happened!) and when you went down the slope, you pressed clutch first and that's very dangerous you know. So you must practice your circuit some more..."
And so, that's how i got 38 points. One may say, wow that's a lot of points. I say, its not that difficult really... One strike, 10 points. I got 2 strikes, that's 20 points. Plus all 18 other minor mistakes - 38 points. Simple. My face turned red. Literally red. I was holding my tears and when i said, "OK..." I turned to my right and saw that the girl next to me, was smiling in a kind of, "Awww... I'm sorry you failed loser." (she passed by the way) look - only then i realised, i freaking flunked. What do i tell my instructor? How do i break the news to Meebops? What about my parents? My instructor was supportive even though he was clearly shocked that i failed. Meebops was kind, as she always is, and gave me a shoulder to cry on and the spirit to try again. My mom, was disappointed too but was also a kind gentle soul i could always lean on. That night, Meebops, myself and a few of our friends went on trip to KL to catch a concert during the weekends. It wasn't the best trip for me but the test definitely made me grow into a more determined, and wiser, safer driver than i ever thought possible. In the meantime, I WAIT. Bah! That’s absolutely right! Failing the test can certainly make you a wiser, safer driver, more determined driver on the road. Maybe you were just nervous, so you forgot some of the things you should have done. The jitters can definitely get your mind side-tracked from what you should be doing. 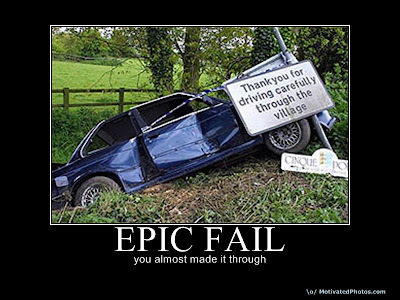 Anyway, I hope you’ve grown more confident in your driving skills!